As much as I enjoy my weekday granola breakfasts, I love our leisure weekend mornings. Slow wake up, extended pj time, and ample time to concoct something awesome to eat. I've been thinking about savoury oats for a little while now, and decided to just jump right in and try it out. The combination of nutty, hearty steel cut oats, a perfectly runny egg and tangy lemon sauce was divine. Next time you reach for your oats in the morning, ditch the cinnamon and brown sugar and try something new! In a medium size pot, combine the oats with 3 cups of water. Bring to a boil, reduce to a simmer, and cook, partially covered, for 30-35 minutes. Resist the urge to stir the oats while they are cooking. 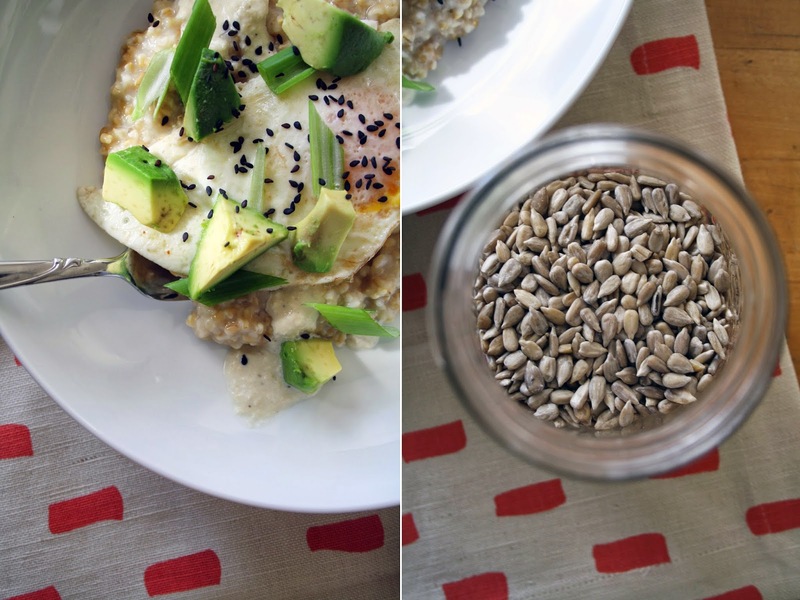 While the oats are cooking, prep your onions and avocado. To make the sauce, combine all the ingredients in a magic bullet and pulse until smooth. Add water in small increments to reach desired consistency. Once the oats are ready, heat a small amount of butter in a pan over medium heat. Fry your eggs as you like them. To assemble, place a scoop of oats on the plate. Top with sauce, egg, avo, onions and some seeds to garnish. Drizzle more sauce on top.